After a call to renew our Adoption tribe cubs from Carrie at Pandas International, I put out the word and we were able to collect 510.00 from the various adoptees in all 4 tribes to renew one of the cubbies!! In this economy and especially over the holidays, I was THRILLED, to say the least, that we were able to collect enough for even ONE!! for tons of info coming up about my upcoming China /Thailand Journey in Early February!! A HUGE THANK YOU TO CARRIE AND TOBI AT PANDAS INTERNATIONAL for all your work on these group adoptions. Ten giant pandas will go to Shanghai, host of the 2010 World Expo, for a year-long display next year, the municipal information office said Thursday. The pandas, six females and four males, include two twins, said Li Desheng, deputy director of the Wolong National Nature Reserve Administration Bureau. They were all born in the Ya’an Bifeng Gorge Breeding Base in the southwestern province of Sichuan after the deadly Wenchuan earthquake on May 12, 2008, Li said. The group will fly to Shanghai in a chartered plane early next year, the office said. They will go on display in the Shanghai Zoo in the first half of 2010 and on display in the Shanghai Wildlife Zoo in the second half. The zoos have built new or renovated existing exhibition areas and established bamboo supply bases to ensure sufficient food for the pandas, said Cai Youming, deputy head of the Shanghai municipal forestry bureau. Giant pandas, known for being sexually inactive, are among the world’s most endangered animals due to shrinking habitat. There are about 1,600 giant pandas living in China’s wild, mostly in Sichuan and the northwestern provinces of Shaanxi and Gansu. China has built 62 giant panda nature reserves that cover 3.2 million hectares and are home to 70 percent of the animals in wild, according to the State Forestry Administration. Hello panda friends!! 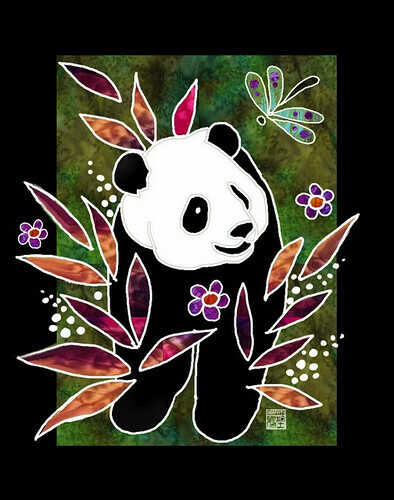 I am pleased to announce my newest venture using eBay to spread the word about Pandas and the wonderful work PANDAS INTERNATIONAL is doing to protect and educate the public about this precious endangered species!! eBay sends my donations to the charities directly through Mission Fish which certainly helps with the bookkeeping! Yippie! That translates to a lot more time for artwork!!! Some auctions and Buy it Now items I will donate 10% (reminding myself I need to eat too..lol) and other items I will be able to offer up to 100% of the sale to this incredible charity. Again, the amount I am donating will be listed right on that Pandas International banner on the auction listing. And keep in mind that not all items going towards Endangered Species are Panda items. This particular Chow print is also part of my donation program with many more items to come in the weeks ahead!